Hello folks! It's nearly the end of the month so it's time for an update on my Mayday! Mayday! 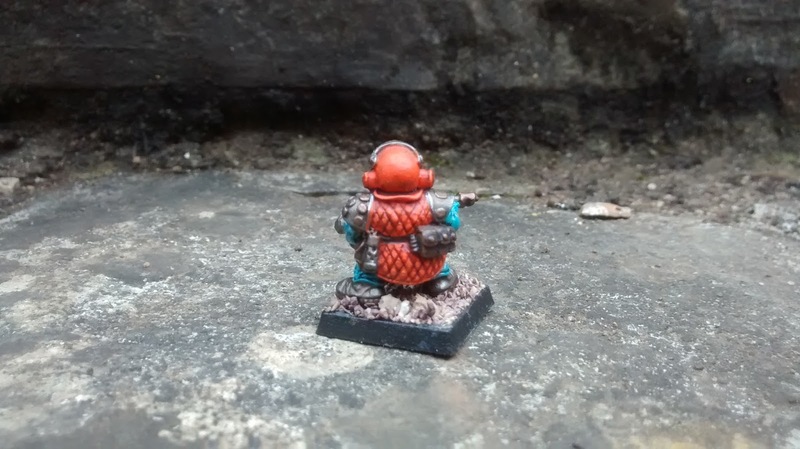 miniature rescue project. I introduced the concept in my previous post, but in brief the idea is to take a half finished but stalled, damaged, or otherwise unloved project and get it going again, finishing or getting as far a long as possible by the end of the month. This year I chose some Middlehammer era Plague Bearers, and wanted to practice my hand at copying existing paint jobs. Above you can see the three PBs I wanted to keep in style with. Below you can see the finished unit of six. 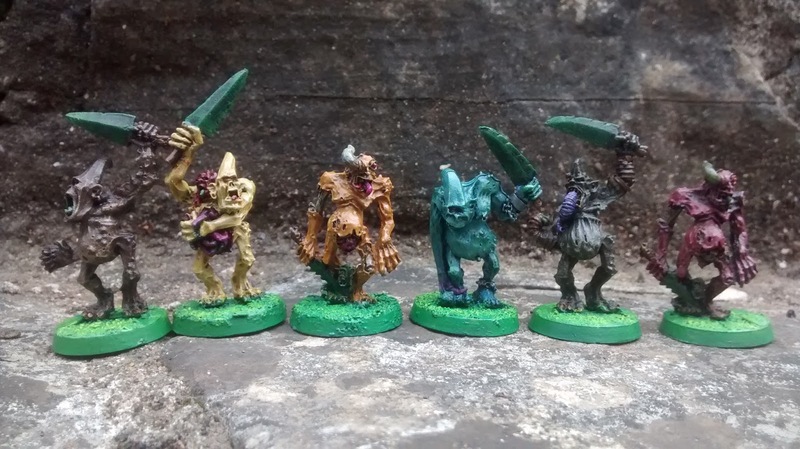 I'm happy with the final result, but the six are far more of a mix than I had originally envisaged. ...and at the end of the project. I just couldn't help myself! I found myself loving the sculpts and the temptation of doing some more striking nurgley colours to offset the dark colours of the original trio was just too much. Bubonic Brown (Citadel), Bilious Brown (Coat D'arms), and Hideous Blue (Citadel) provided the base colours, and I sought to tie the unit together by redoing the swords of the original trio with a more pronounced greenish tinge. 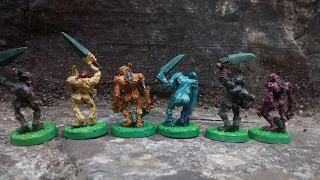 This, plus the day-glo Goblin Green bases, means they don't look like COMPLETELY different units, but I haven't achieved my original aim of emulating another painting style. You know what, I don't care. 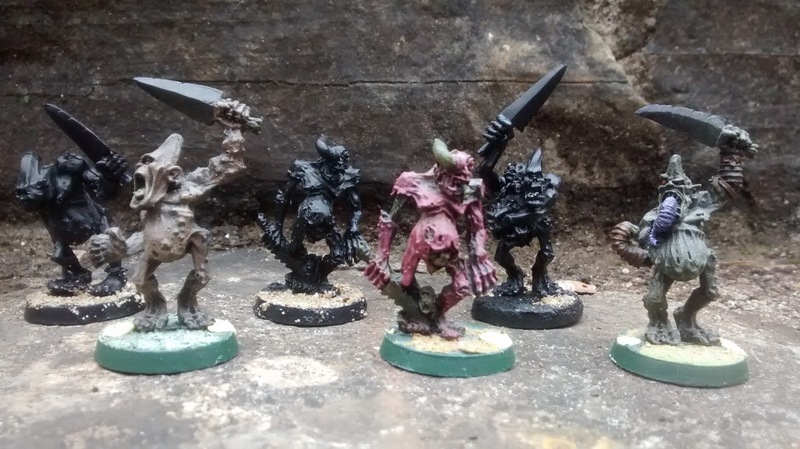 I had loads of fun painting these and I'm looking forward to an excuse to use them in my D&D campaign as some sort of super charged pus filled exploding Zombies... or something. My three in the middle. Obvs. 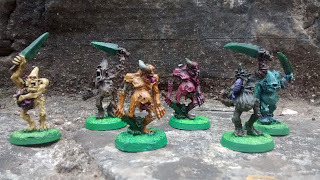 Actually, I enjoyed painting them so much the Plague Bearers were finished pretty quickly into May, and I decided to pick up another stalled project, for Mayday! part 2. 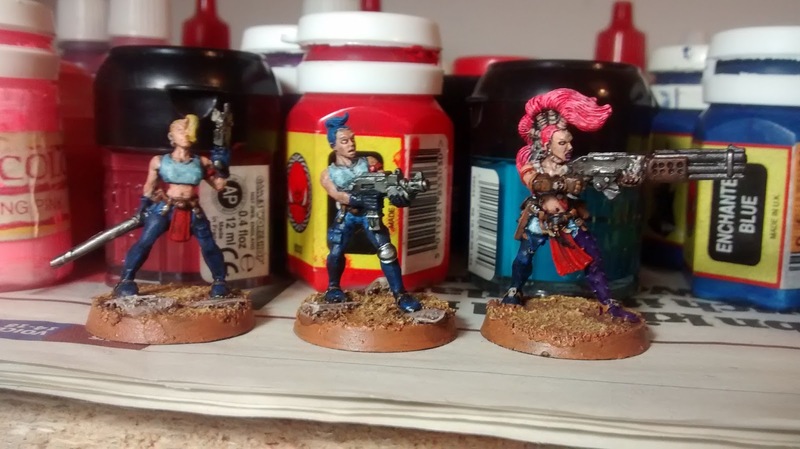 Escher gangers from Necromunda, with a couple of minor weapon conversions. Which were themselves a spin off of another, bigger project which also needed kick starting! So it was ticking all the boxes for Mayday! The colour scheme was largely dictated by the campaign setting they are going to fit into. 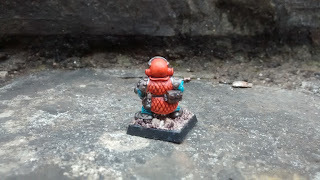 The dark blue leather/ flak armour/carapace used on my PDF forces, and various scavengers of ex-imperial equipment, has been carried over here, along with the bright red spot colour signifying them as gang members, the denim blue and stained white T-Shirts and vest tops also echo the fashions of other gangs they will be fighting alongside/against. 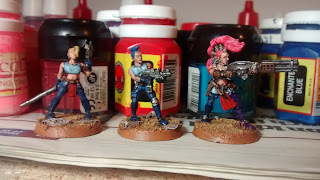 The Bright colours of their hair will set them apart as their own unit, or as distinct members of a bigger gang if they team up at any point. 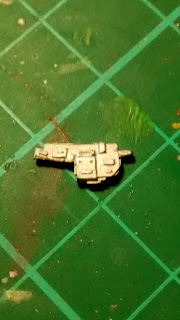 The weapon conversion on the full gang member (back half of an auto gun, front half of a shot gun) was as I bought it, although it needed repair after stripping. 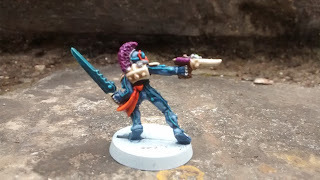 I will confess that I had not even noticed this when I bought the lot on eBay so was a bit surprised when she came out of the goop with only half a gun! The weapon conversions on the blond juve were both necessary as she came without any. The haft of something chunky had been left in her right hand (looked like it might have been an axe, I haven't bothered to check) and she was bereft of pistol. 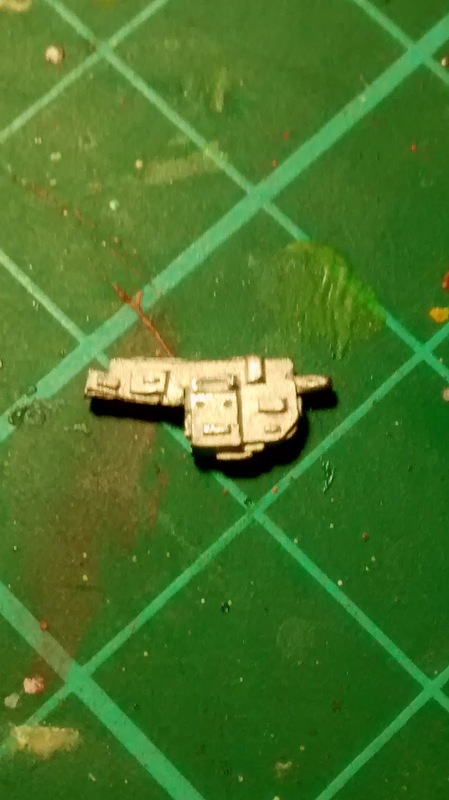 I added a short length of resin sprue to look like a metal pipe, and the pistol I had cut from the Xenos Rogue to act as an alternate pattern auto pistol. You can't see the pistol clearly in the final shots, so here is a close up of what I'm on about. 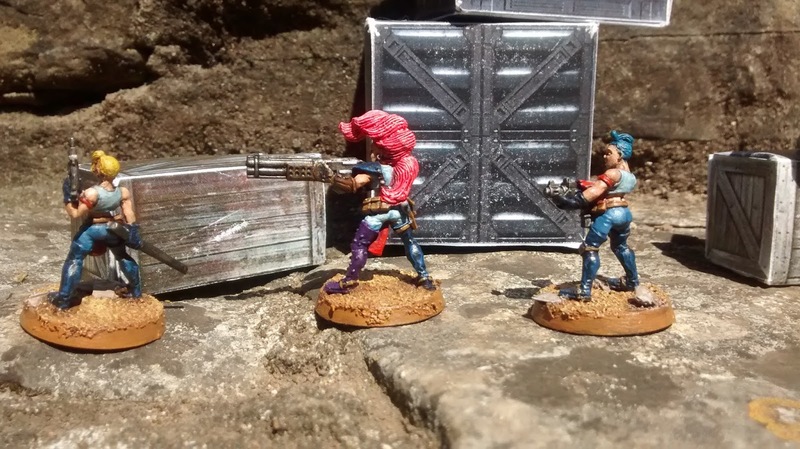 The gangers are just sizing up some cargo crates to break into when they hear a noise. Is it customs officials? Wait! What was that behind them. That didn't sound like no stinking customs official! You will have to tune in to the next instalment of my Rogue Quest project to find out what is about to befall our brightly bouffanted beauties, but for now thanks for stopping by, and don't forget to share your own Mayday! Mayday! projects on the Middlehammer Facebook group. Well, it is safe to say this project has more than met my hopes! 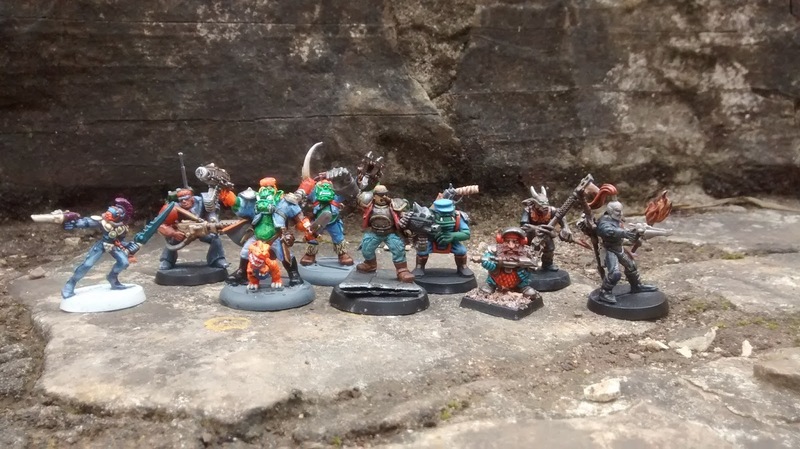 It's been every bit as much fun as I thought it would be, I've been drawn back into the undeniable charm of Rogue Trader, and I've made some new friends along the way which is by far the best bit! 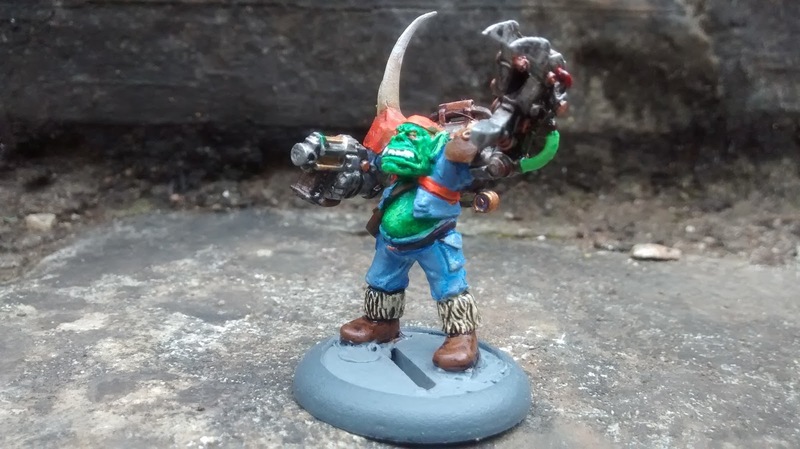 Congratulations to George who won the prize draw, somewhat aptly as the group seemed to elect his characterful conversion of a Catachan Lt. (a Middlehammer classic imho) the defacto Boss Man of the Strikeforce - although just between you and me, I think the Ork with the power claw, yeah the shifty looking one... No! the other shifty one, yeah, well he might have his eye on the top job of this outfit if the Boss isn't careful! Thanks again to Axiom for his advice and encouragement when I was kicking this thing off - looks like there is enough interest to do it again next year! If you are just tuning in and have missed all the fun, you can catch up on the background to the project here, and look forward to joining in next time! Grog, Drog and Biter had gotten around the immigration laws on the space station by simply not bothering with them. They just sneaked out of the cargo ship as easily as they snaked aboard it. (I.e. by clobbering two guards and walking away). Now they were free to roam the Space station Aldenaar, the hub of commerce and adventure, time to get some contacts and find a new gig. The brothers had a long extensive career as bodyguards (not so successful) and robbers, quite successful (especially by robbing trustful people who hired them as bodyguards). But they wanted a real challenge, some big monster or hoard to get, perhaps a Space Hulk to plunder for tech and materials, so they could return to their small planet Scarus, a haven for ork meks, and have something to show for it. Grog was the better mek, and responsible for modifying the small ancient squat-tech power source to give power to Drogs bionic arm and adjusting it to be small enough to carry around. Thanks to the ancient tech Grogs arm was far superior to the other powerclaws out there. Sadly the same could not be said for Drogs “powersword”, sure it looked good, but the most power he had gotten from it had made them able to fry eggs now and then. Still it glowed with a spooky blue shine and sometimes that was enough to scare off the lesser ruffians that still roamed the seedier parts of the stations they usually frequented. Still, apart from the blue shine, the sword got hot, but did not hurt much more because of it. Unless they were on an ice planet, he rarely had any proper use from it. Still, they were alive and armed, had some credits in their pockets and some raw meat so Biter did not bite them. Life could be worse. Ahh, there it was, Persephone, the bar where Grog knew he could find someone that could get them in touch with like minded adventurers (not too like minded mind you, it would be better if the brothers were the only ones ready to stab others in the back). No animals allowed?! 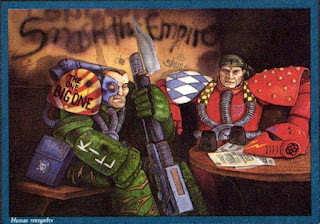 Sod that, the brothers and Biter walked into the bar and took a booth…. and waited for the rest of the crew to arrive. 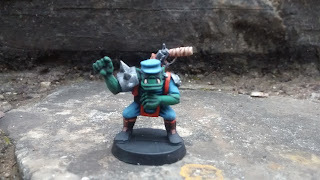 Both brothers are Ork minor heroes with a stat line that only differ in two places Grog is smarter, Drog is stronger. Grog also has an extra attack due to Biter helping out. Extract from investigation into the death of Ordo Hereticus Interrogator Evander and the disappearance of the painblade Caleburn. "Subject (designate - 'Firebrand') xenos species eldar; confirmed identification from pict recording [servo skull d11-2 06:12:16 - 06:14:03 320.882.M41] as part of corsair warband Reavers of the Rising Flame; partial match [87%] security vid from remains of independent trade ship 'Blessed Providence' Scarus sector, Segmentum Obsurcus152.903.M41; fleeting image [00:00:06] head cam Adeptus Arbites officer 0013652 Garcia during sacking of Wilhelmsburg 425.955.M41; (rambling discourse from savant Caractacus Mott, associate of Inq Vail Ordo Xenos) summary - subject wearing distinctive, mismatched armour. 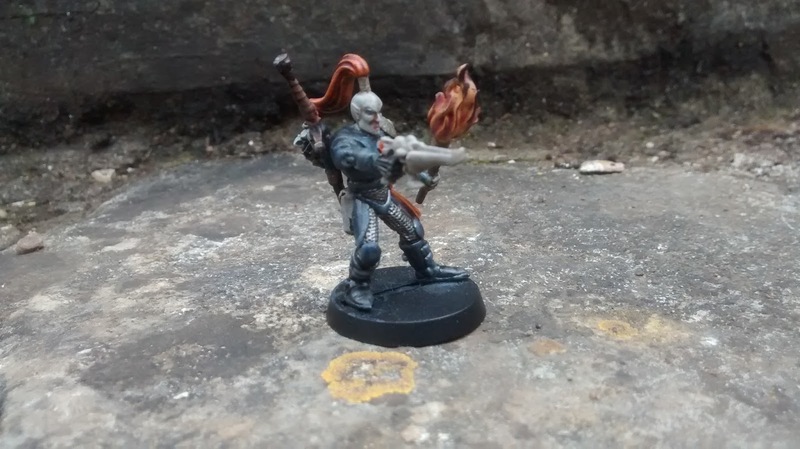 Identified as partial Tau 'fire warrior' body armour and parts commonly seen on sub-species kroot. Possible links with Faxlignae - Scintilla 260.993.M41; most recent sighting - space hulk 'Foreboding'. Sighted with number of subjects. 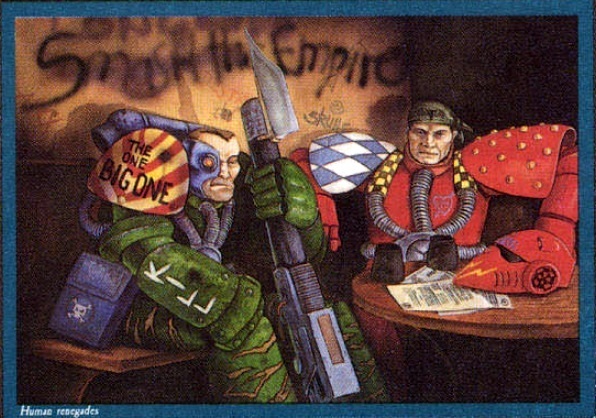 Confirmed figures as unidentified humans , eldar , abhuman/mutant , orks , abhuman  - believed to be sub-species [DELETED - security clearance epsilon required]. At the far end of the service duct heat haze showed up the vague outline of one of the ship's security detail. Dulled where the carapace armour hid the target's body heat, the mutant's sight showed there was still plenty of room for the archaic rifle's poisoned shards to do their work. Motioning with his clawed hand he signalled the first wave of the warband through. A pair of eldar - alike in their grace and swift passage, different in demeanour; two brutish orks, followed by a man, stinking of promethium. Little had changed. 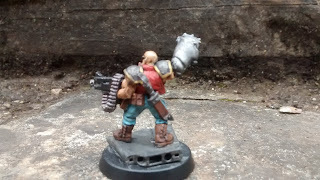 Underhive to the lower levels of a space hulk - mutie gang to mercenary - still following a paymaster and anyone who would tolerate him. A grin crossed his bestial face - at least there would be plunder and good eating with this lot." 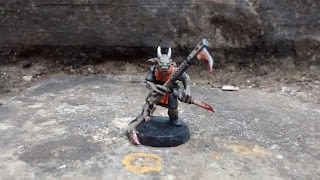 Kalus wears robes and has Toughened Hide (Counts as Mesh Armour 5+), has Vestigal Horns and Infra-vision, carries a Needle Rifle with double combat Blade (counts as two hand weapons, a Knife, and Blind Grenades. 'Enge da Mekboy clearly the ork got the wrong bus and was one of the last of the crew to arrive at the rendezvous. He is a mek from the blood axe clan on a cultural exchange program. He has learned several classic terran dances and rituals such as gangnam style, uptown girl and the quick fit fitters. The group has banned him from "making improvments" to their equipment. 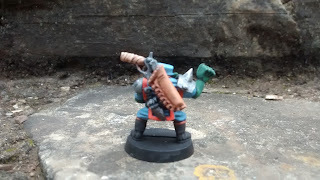 He is armed with a knife and pump action bolter (I rolled a combi bolter/shot gun). 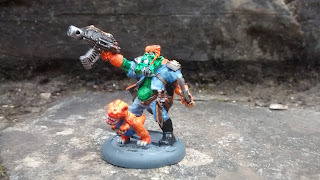 'Enge da Mek wears Flak Armour (6*+), and Cool Shades (Counts as Photchromatic Visor) and carries a Pump Action Boltgun (Fires twice per round), and a knife. Ostrinus was a fighter pilot for an Eldar outcast group, the Alveare Reavers. 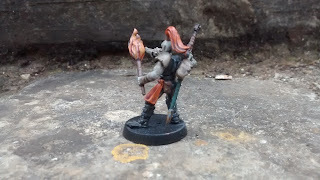 The group while employing the normal corsair methods of piracy and smuggling to fund their operations, their main goal was to spread the word of the old ones, the creators, the true gods who will become the saviour of the Eldar. The Captain of the Alveare Reavers, was father and oracle to them all, a wise old figure who had seen more than some farseers, his love for all the crew was boundless, but nothing lasts forever….the Alveare Reavers are no more, Ostrinus will not speak of what happened, he doesn’t speak much at all, since he lost his place among his brothers he joins up with any mercenary crew hiring choosing to loose himself in the battlefield. Ostrinius wears Mesh Armour (5+), and his Helmet (Communicator, Photochromatic Visor, Breathing Equipment), carries a Shuriken Pistol and a Force Sword. He has Psychic Mastery Lvl 1 and a Psi Level of 10. He has the psychic abilities: Telepathy, Hypnotic Gaze, and Steal Mind. 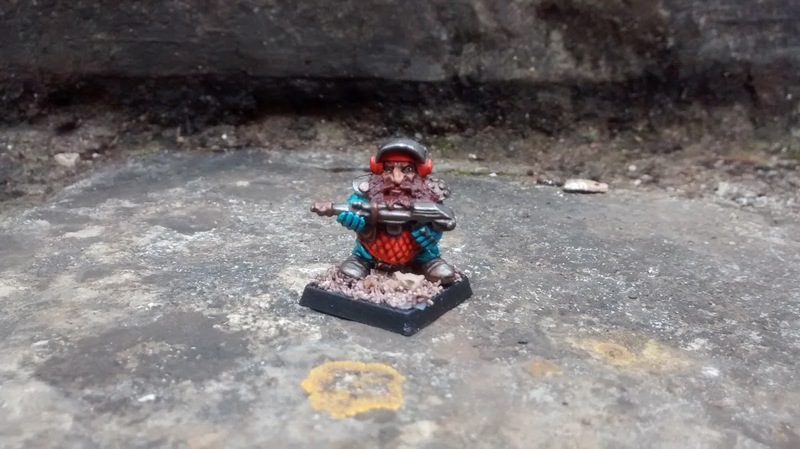 Harund Norgyr is the fourth (of twelve) sons of the Lord Kjartan Norgyr, squat warlord and head of the Norgyr league. From an early age Harund was keen to distance himself from his hereditary status and instead enlisted in the military as a basic guild trooper. A natural with a lasgun and possessing his father legendary constitution it would have been easy for Harund to rise through the ranks to a command position. 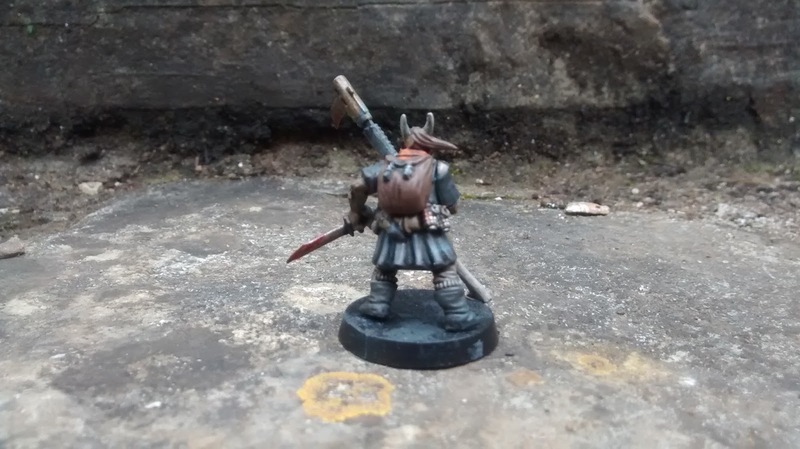 This was not the life Harund sought; he preferred the camaraderie amongst the rank and file brothers, drinking in the guild halls and bleeding on the front lines. As the years of service past a lingering discontent grew within Harund and was in turn reflected in the general populace of The Norgyr leagues. 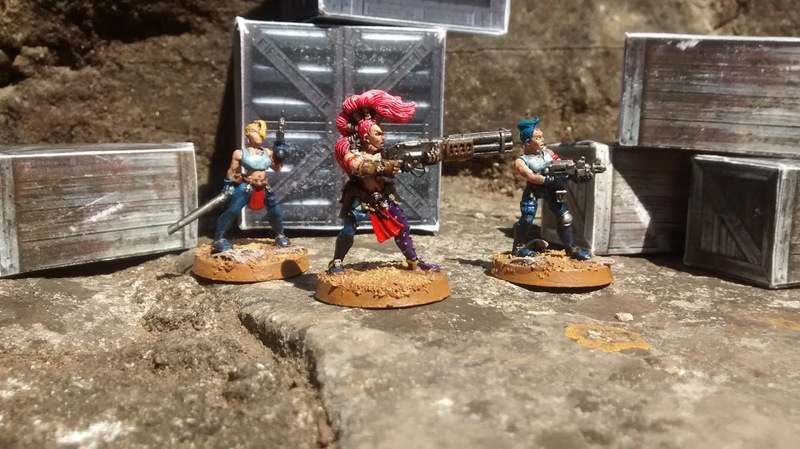 Where once the squats were an independent and honourable race of warriors and artisans they increasingly became nothing more than a vassal for the imperium of man. Entire strongholds of the Norgyr guild engineers were dedicated to reproducing once highly guarded STC’s for the imperial army and even battalions of Squat brothers were gifted as auxiliary to the imperial war machine. 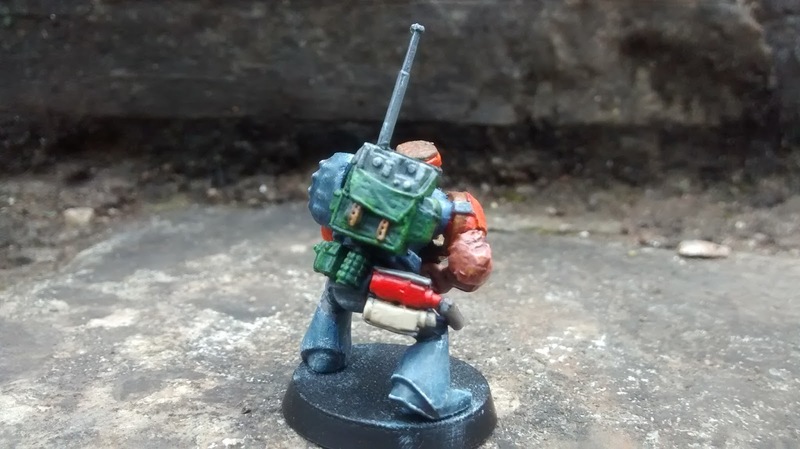 It was as if the very idea of the Squats was in danger of becoming a footnote in the annals of the imperium of man. The final straw came when Harund found himself as part of an honour guard escorting his older brother Hakon to meet with imperial dignitaries. Harund like his fellow soldiers wore a full helmet and ceremonial regalia so was unrecognisable to his older brother. “What are those Things?” pointing in the direction of Hakon and his honour guard. “Those, those are squats!” replied the other, the disdain obvious in his voice. The first officer chuckled a forced and humourless laugh. 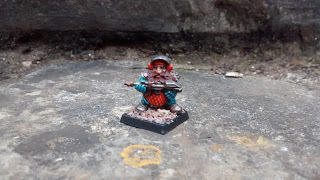 Harund could feel every member of the honour guard tighten their grips on their axes, each brother waited for the lord Hakon to unleash them upon these arrogant humans….. But to their shock the order never came, Hakon just joined in the laughter like a whipped hound trying to appease its master. The squat lords of old would have bludgeoned these fools to death with their own recently liberated femurs. Within two days of their return to the leagues Harund had packed a few personal belongings into a rucksack, armed with his trusty lasgun he left to seek adventure in the stars. The squats were doomed he thought, if that is how the rest of the galaxy sees us then we might as well fall victim to some calamitous downfall. 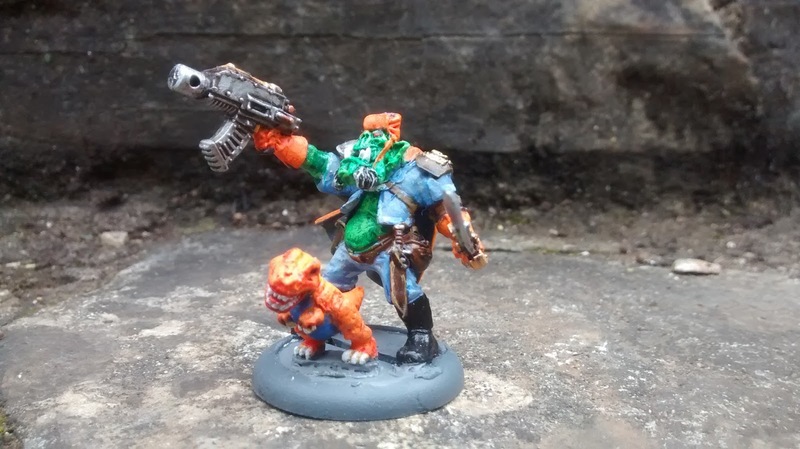 Harund wears Flak Armour (6*+) and Photo Visor, and carries a Lasgun and an Axe. Hudd Paxton grew up in Scottstown, a medium sized mass-agri settlement on Ridley's World. 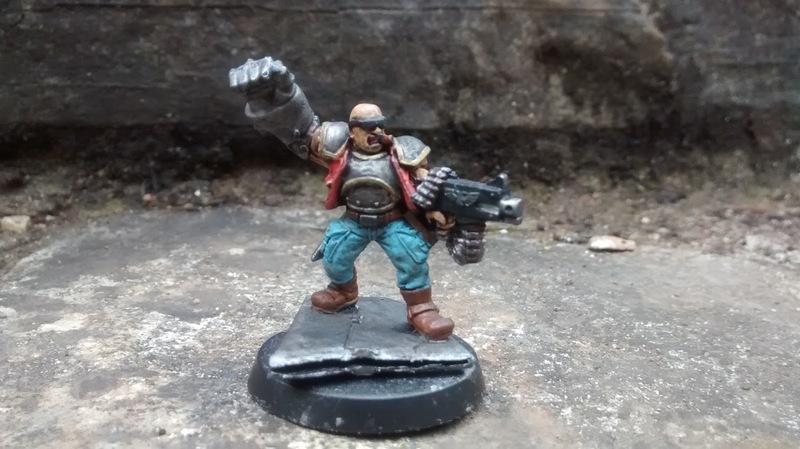 His family worked hard for the local Imperial task masters, and it was a source of pride when the young Hudd was drafted into the IG regiments being conscripted for the campaign to liberate nearby colony world LV426(b) from unknown Xenos infestation. Hudd wears Power Armour (3+) and Cool Shades (counts as Photochromatic visor), carries a Flamer, Frag Grenades, Long range Comms unit, and a Combat Technicians kit. 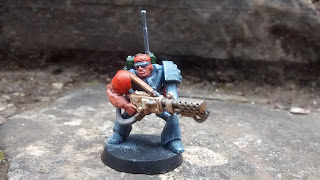 Captain Shepherd wears Carapace Armour (4+), Cool shades (counts as Photochromatic visor), has a bionic Powerfist, and carries a Bolt Gun and a Knife. 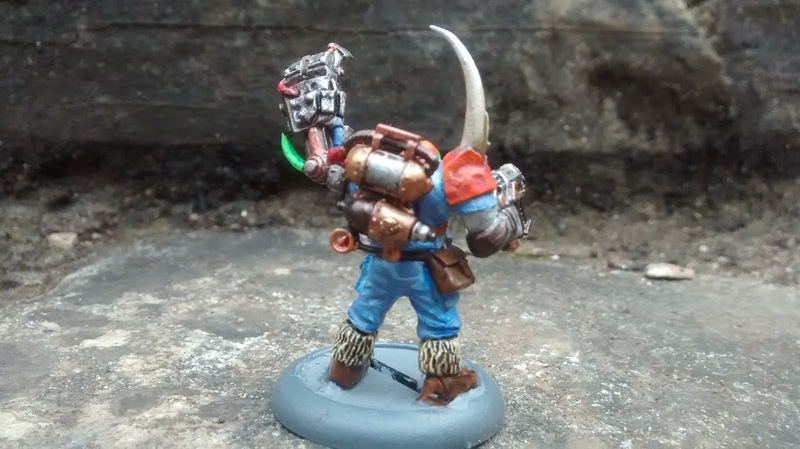 Thanks again for stopping by, hope you have enjoyed reading all the backstories that we came up with for our crazy kit-bashed Rogue Trader 30th anniversary honouring mercs, and that you are inspired to join us next year! 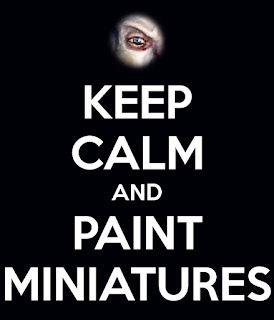 Do you have miniature projects in desperate need of rescue from obscurity, mistreatment, and horrendous half finished paint jobs*!? Need some motivation? 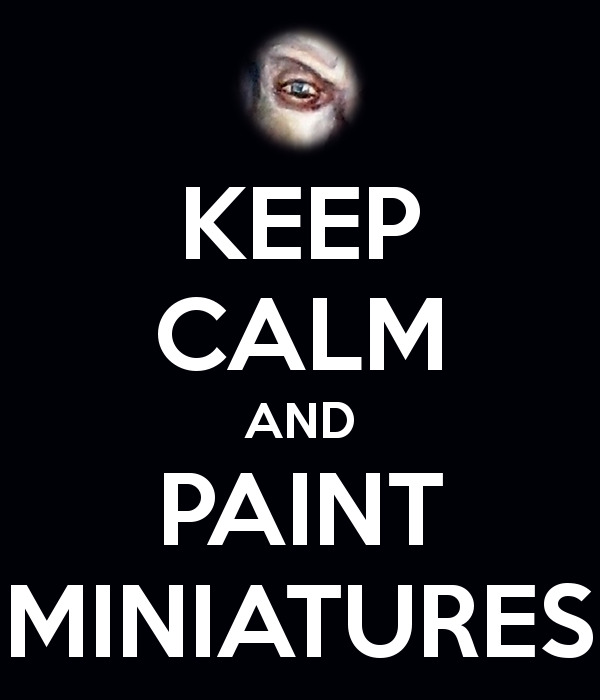 Well then, this is the monthly painting challenge for you my friend! 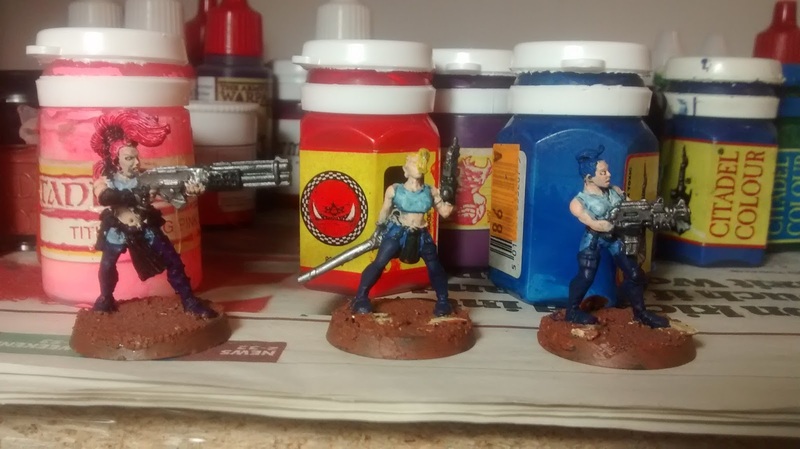 The idea for this challenge is that it provides motivation to pick up and crack on with one of those projects we all have gathering dust and cluttering up our painting queues. 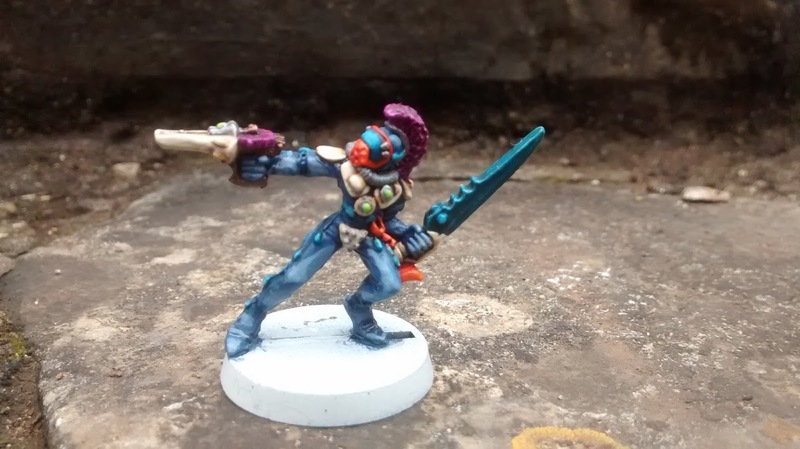 It's a hobby project, not a competition, but the challenge is to share your projects as they are now and then finish (or get as far as you can) by the end of May before sharing your results with the community. For last year's Mayday! Mayday! project I rescued a unit of Middlehammer era Goblin Wolf Riders (WFB 6th Edition?) that I had bought in a half built/half broken, part painted state from e-bay for cheapness a few years previously and had never got table ready. It got me to try out press moulding for the first time, and I haven't looked back since then, using the technique in scenery projects as well as simple mini repairs on a regular basis (I'm a late developer hobby wise 😉 ). This year I'm going to try and develop a painting skill and the project I've selected is going to require me to adapt my painting style to match someone else's existing work. This is something I've tried before with mixed results and I have a few examples of job lots of minis in my stash where this might be a more practical option, so it could be a useful skill in the future. A while back I picked up a handful of Plague Bearers (3rd Edition 40k era?) that had been mostly painted but needed finishing, and then a while later I got a second batch unpainted that I thought to do in the same style as the ones I already had. Anyway, here they are now. 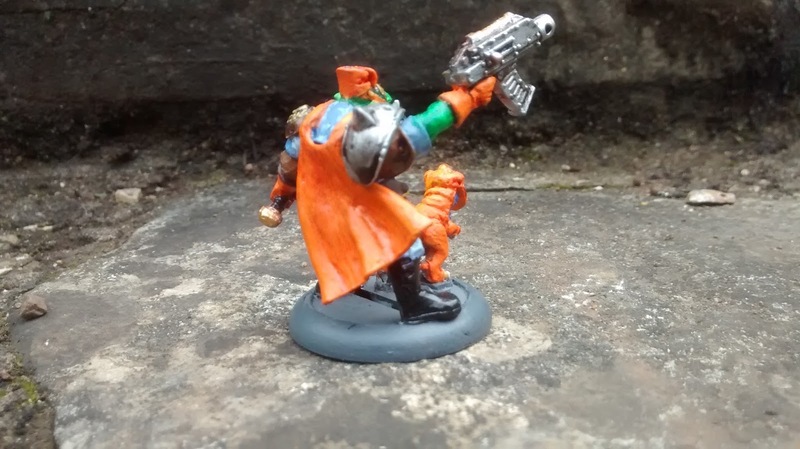 A bit of putty was required to fill the gaps in the basing left by the previous owner - no really this time! - and the others have been undercoated black ready to go. It's only a modest number of models, partly as I have lots of other projects on the go at the moment (isn't that how I got into this mess in the first place!? ), but partly because I expect to have to do a bit of experimentation and correcting of mistakes with these. I'll be happy if the six of them don't look like two completely different units at the end of the month. So, what are you going to be dusting off, gluing back together, and painting up into the shining jewel of your collection by the end of the month!? Thanks for stopping by, stay tuned for project updates.